Everyone who tried these cookies raved about the orange and ginger flavor. The only thing that I changed in this recipe was the amount of sugar. I almost always find that there is too much sugar in cookie recipes for my taste so I always decrease, sometimes by a little and sometimes by almost half. For this recipe I decreased the amount of sugar to just shy of 1 cup instead of 1 1/4 cup. I could not find the candied orange in the store. I was actually not sure where to find it other than the grocery store, so instead of running all over the place, I ordered it from Amazon. I have made it in the past and it is very simple, but this year I just did not have the time. I found this recipe in the December issue of Oprah magazine. Enjoy! In a food processor fitted with a metal blade, puree almond flour, sugar, egg whites, candied orange peel and candied ginger until smooth. Add cranberries and pulse twice, until just combined. Transfer to a medium bowl, cover and freeze overnight. Preheat oven to 350°. Line two large baking sheets with parchment paper and set aside. Put confectioners’ sugar in a small bowl. Roll chilled dough into 1″ balls, leaving half in the freezer while you work the first batch. 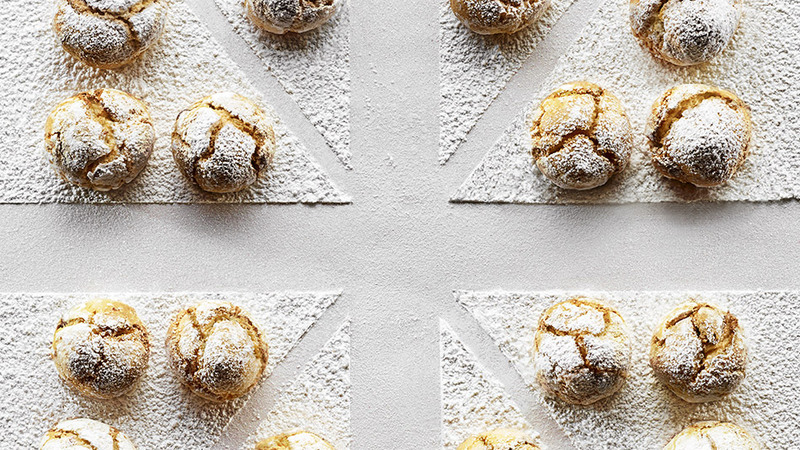 Coat each ball in confectioners’ sugar, then arrange on prepared baking sheets, spaced 2″ apart. Repeat with remaining dough. Bake until light golden brown, about 15 minutes. Remove from oven and let cool on baking sheet 10 minutes before serving. Store in an airtight container up to 2 weeks or freeze, wrapped in plastic in an airtight container, up to 1 month. This entry was tagged almond flour, candied ginger, candied orange, candied orange and ginger cookies, open house 2015, Oprah, oprah magazine.